Knovel provides faster access to answers, better data discovery and a more tailored experience so that users can more quickly address engineering challenges. For example, in Chemical R&D, access to comprehensive chemical properties data on important topics, such as thermodynamics and safety, provide key inputs on material selection for new product development quickly and efficiently. 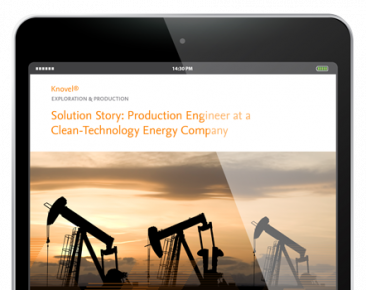 Discover how Knovel helped a production engineer at a clean-technology energy company solve a scaling problem, enabling accelerated market entry. A clean-technology energy company had patented a cleaner, more energy-efficient process for heavy oil extraction. However, in the research around scale-up, potential problems with line erosion and pump cavitation arose. Information from Knovel was used to find the correct pump type and operating conditions, enabling accelerated market entry for the optimized process. Learn how Knovel helps engineers from diverse industries operate more efficiently and effectively. In addition to supporting operational efficiency and effectiveness, Knovel enables engineers to operate more safely and reduce costs. In Academia, Knovel helps students build knowledge that prepares them for engineering careers.